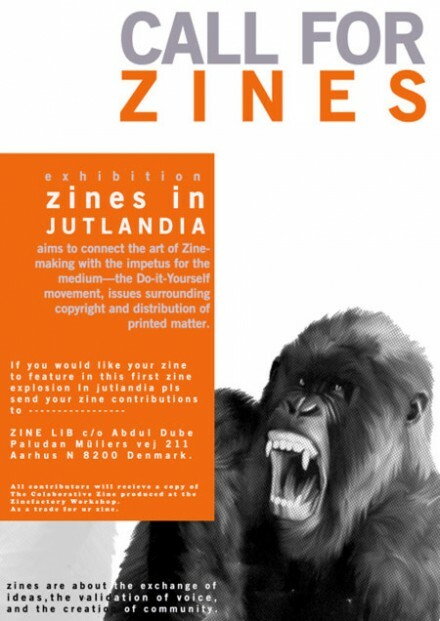 Abdul Dube calls for con­tri­bu­tions to the first zine exhib­i­tion in Århus with the work­ing title »Zines in Jut­land­ia«. Along­side the exhi­tion Abdul will host a Zine­Fact­ory (Cut, Copy, Col­late: zine con­struc­tion — A two day fan­zine work­shop) for every­one inter­ested in selfpub­lish­ing. The Zine­fact­ory takes place in con­junc­tion with the Nybyg­gen­er (Set­tlers) exper­i­ment and will be held at the Ride­hu­set in Århus.